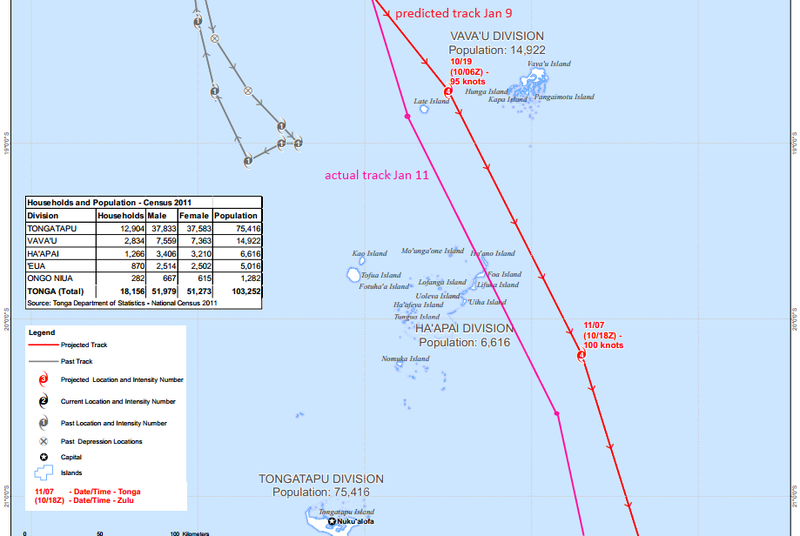 Cyclone Ian Track! LIFUKA IS THE MAIN ISLAND OF HA'APAI, one of the 70 or so islands that makes up the Ha'apai district of the Kingdom of Tonga. Although it may be confusing, there is no island named Ha'apai, and when one speaks of Ha'apai one is referring to either the whole district or to one of the islands, mostly that means the islands of Lifuka and Foa which are connected by a causeway. The main city is Pangai, where there is a bank, guest houses, seaport, schools, markets, one restaurant, and airport nearby. The two big volcanos to the west are Tofua and Kao, which along with Hunga Tonga and Hunga Ha'apai are active geologically and inhabited by only a few hardy kava root farmers (if at all), and the rest of the islands are low flat raised coral islands. Captain Cook spent a couple of months at Nomuka and really liked it there. 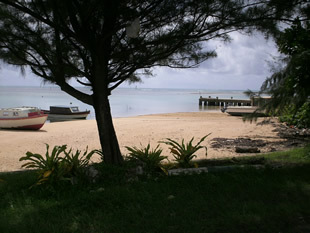 Tofua was the place where Captain Bligh was left with only an 18' open boat after the 'Mutiny on the Bounty'. He lost one man leaving Tofua, and then sailed that little boat to Papua New Guniea without further loss. Surely one of the most amazing feats of sailing history. 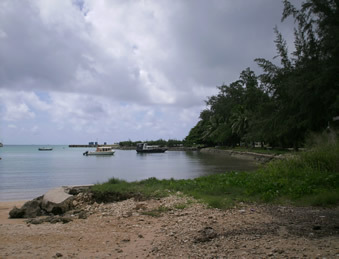 This is the waterfront of Pangai, the main city on Lifuka and the place most often referred to when one speaks about Ha'apai. The little jetty in this photo is a favorite place for swimming. There are several local fishing boats here, and often you will see one docked at this jetty to unload the catch for the marketplace close by. This view is at 'half tide' so some boats are up on the shore and some are still afloat. You can see a little bit of the small breakwater behind the jetty. 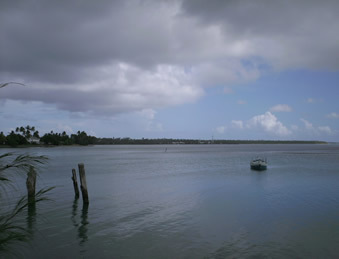 Ha'apai harbor is not very protected and in the case of a big storm it is not a good place for sailboats to hide from the storm. This is the view up along the waterfront towards the main wharf from the fishing jetty. There are several boats moored along the way including the british landing boat that was a gift to the governor. I have never seen this boat go out from the harbor, and they tell me it is very expensive to repair. There are a few containers on the main wharf back there. When the yachts come in to Ha'apai this is where you will see them lined up. It's also a place where locals wait for their ride to a neighbor island to come in. On Friday afternoon there are lots of locals going back to their homes on Ha'ano or Uiha, the two nearest islands without road access (or horseback access in the case of Uoleva). Sometimes you will find people going out to Ha'afeva or Nomuka, the two main western Ha'apai islands a bit further out from here. 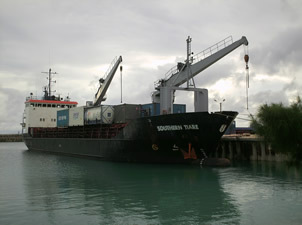 Ships with cranes can unload containers in Ha'apai. This ship comes from New Zealand several times a year to bring containers of cargo and to take back mostly empty ones. The containers are maneuvered onto the wharf area by cranes but then must be unloaded by hand onto trucks. The containers never leave the area adjacent to the dock where they arrive. Weekly ferry boats move most of the cargo into and out of Ha'apai. The 'Otuanga'ofa leaves Nuku'alofa on Monday night and will arrive in Ha'apai early on Tuesday morning stopping at Pangai, then head up to Vava'u at noon. Then they turn right around and leave Vava'u Wednesday night, stopping back in Pangai Thursday early in the morning, and then go back down to Nuku'alofa by the afternoon. This is the view from the main harbor area back past the fishing jetty towards the village of Hihifo, which is a village adjacent to Pangai. You can see how open the whole harbor area is. The Royal residence is visable at the left. In the back you can tell where the hospital and TCC communications tower is. You can also see how Lifuka is a very flat island. 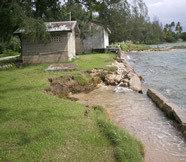 Many scholars believe that this shoreline is the place where the first Lapita travellers came to Tonga, marking the beginning of virtually all Polynesians. There are remains from an archeology dig in Hihifo dated before 1000 B.C. The little sailboat looks very lonely. Several of the 'Yachties' who have come to visit Tonga have given up their travelling ways and find happiness as a landlubber, just like the Lapita ancestors from history. I have'nt ever seen this little yacht go out sailing, probably just another happy Ha'apai resident now. The earthquake of May 2006 caused the whole island to sink about a foot, but it may rise (or fall) the same or more during a later one. This along with rising sea levels due to global climate change presents a risk to Ha'apai that is clearly evident in the photos here. This is not a particularly turbulent sea that has breached the seawall along the waterfront. You can see in the back that the ocean is just about up to the same level as the fishing jetty too. 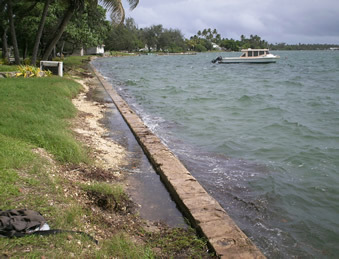 The approach area to the jetty is awash with seawater during particularly high tide periods. It is only a matter of time before the approach will wash away and repairs will be needed to preserve the jetty. This damage from the sea level rise is really disturbing and the cost of replacing the seawall will be very expensive I am sure. The building in the photo below was a public toilet, no longer in use. 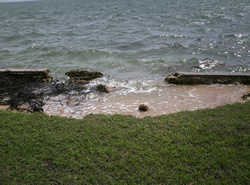 The septic tank is now less than a meter from the ocean.